Some folks get excited about money, fast cars or a big fancy house. Not me, I get excited about a new shipment of pumps fresh off the plane at FedEx in Anchorage . 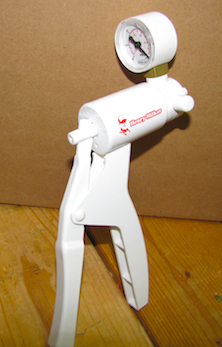 It's a custom pump designed especially for the Henry Milker. One thousand pumps arrived. 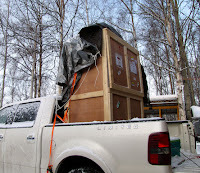 A fork lift loaded this crate onto my truck......very smart. Since I do not personally own a fork lift the pumps were unloaded 1 at a time once I got home.......not very smart. Wow! That's awesome Mike! I guess you must be selling enough to justify buying 1000! I'm very happy for you... what a great success story! I expect to someday see you on national TV showing off your cool device! Congrats on your success!